Karel van Mander's The Continence of Scipio, 1600. Karel (Carel) van Mander (or Vermander), was a Mennonite painter and poet. He was born in May 1548 in Meulebeke in Flanders, Belgium. After a short period in Rome and Vienna he married Ludovica Buyse, painted in Kortrijk (Courtrai) and Bruges, left Flanders in 1583 for the sake of his conscience (it is not known when he joined the Anabaptists), and became the head of the Haarlem School of painting. He was the teacher of some noted Dutch painters, including Cornelis Cornelisz van Haarlem, Hendrick Vroom, and Hendrick Goltzius. He lived in Amsterdam from 1604 until his death on 11 September 1606; "he was buried with the laurel wreath." Van Mander was a man of versatile gifts. In resisting foreign influence he added to the development of the Dutch language. 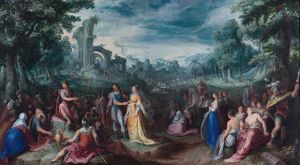 Although he was under Renaissance influence (in 1597 he published a Dutch translation of Virgil's Bucolica and Georgica, and later a commentary on the Metamorphoses of Ovid), he was opposed to the pagan influences in the world of art. His poetry, which is of slight literary merit, clearly portrays this conflict. His collection of poems, De Gulden Harpe, inhoudende al de geestelycke Liedekens (Haanlem, 1599, reprints Alkmaar, 1605; Enkhuizen, 1607; Amsterdam, 1613, 1620, 1626; Haarlem, 1627; Rotterdam, 1640, 1656; Enkhuizen, 1709), shows typical Mennonite traits. Van Mander, however, played no important role in the church. He belonged to the Old Flemish branch. His Gulden Harpe was used as a hymnal in some of the Old Flemish congregations. Mention should be made also of van Mander's volumes of poems, Tafel-boecxken, inhoudende voor en nae den eten verscheyden dankseggingen en tafelredenen, in rijm gestelt (Alkmaar, 1603), Olyf-Bergh ofte Poëma van den laetsten Dagh and Bethlehem, dat is het Brood-huys, both published in 1609 after his death. Bethlehem was reprinted in all the editions of the Gulden Harpe, from 1613. Few of van Mander's paintings have been preserved. His fame today rests chiefly on his Het Schilderboeck, which he began in 1597 and published in 1604 (reprints 1764, 1936, 1946). It contains the biographies of Dutch artists, and constitutes the chief source for the study of early Dutch painting. There are also French (1884 f.) and German (1906) versions of the Schilderboeck. Cate, Steven Blaupot ten. Geschiedenis der Doopsgezinden in Holland, Zeeland, Utrecht en Gelderland, 2 vols. Amsterdam: P.N. van Kampen, 1847: II, 210. Greve, H. E. De bronnen van Carel van Mander voor "het leven der doorluchtighe Nederlandsche en Hoagduytsche schilders." 's-Gravenhage: Nijhoff, 1903. Hege, Christian and Christian Neff. Mennonitisches Lexikon, 4 vols. Frankfurt & Weierhof: Hege; Karlsruhe; Schneider, 1913-1967: II, 669; III, 11. Jacobsen, Reindert. Carel van Mander (1548-1606), dichter en prozaschrijver. Rotterdam: W. L. & J. Brusse, 1906. Reprinted Utrecht: HES, 1972. Kalff, Gerrit. Geschiedenis der Nederlandsche letterkunde. Groningen: Wolters, 1906-1912: III, 387-413. Kühler, Wilhelmus Johannes. Geschiedenis van de Doopsgezinden in Nederland II. 1600-1735 Eerste Helft. Haarlem: H.D. Tjeenk Willink & Zoon n.v., 1940: 117-124, 130. Molhuysen, P. C. and P. J. Blok. Nieuw Nederlandsch Biografisch Woordenboek. Leiden, 1911-1937: I, 1295-1298. Noë, Helen. Carel van Mander en Italië: beschouwingen en notities naar aanleiding van zijn "Leven der dees-tijtsche doorluchtighe Italiaensche Schilders." 's-Gravenhage: Nijhoff, 1954. Thieme, Ulrich. Allgemeines Lexikon der bildenden Künstler von der Antike bis zur Gegenwart Leipzig: Engelmann, 1907-: XXIII, 606-607. Zijpp, Nanne van der. "Mander, Karel van (1548-1606)." Global Anabaptist Mennonite Encyclopedia Online. 1957. Web. 21 Apr 2019. http://gameo.org/index.php?title=Mander,_Karel_van_(1548-1606)&oldid=162958. Zijpp, Nanne van der. (1957). Mander, Karel van (1548-1606). Global Anabaptist Mennonite Encyclopedia Online. Retrieved 21 April 2019, from http://gameo.org/index.php?title=Mander,_Karel_van_(1548-1606)&oldid=162958. Adapted by permission of Herald Press, Harrisonburg, Virginia, from Mennonite Encyclopedia, Vol. 3, p. 453. All rights reserved. This page was last modified on 1 January 2019, at 11:20.